The Great War may have ended nearly a century ago, but its legacy lives on. As these remarkable images taken by Irish photographer Michael St. Maur Sheil illustrate, it's going to take a very long time for the scars of this war to completely heal. All images Michael St. Maur Sheil; they are republished here with permission. Be sure to check out his exhibition project, Fields of Battle, Lands of Peace 14-18, which will be opening in London on Aug 4th. More pictures can be seen at WesternFrontPhotography. Top image: The Somme in Northern France. Though it's been nearly a century, the scene of one of the Great War's most infamous battles still bears its telltale marks. Trench lines criss-cross the landscape, while the craters from artillery shells continue to pockmark the fields where more than a million men were wounded or killed from July 1st to November 18th, 1916. Following the failed Nivelle Offensive in April and May 1917, British and Territorial forces launched an attack on the Germans that eased the pressure on the demoralized French troops to the south. The battle, which raged from June 7th to 14th, claimed over 50,000 casualties on both sides. At one point, 10,000 men were killed in an instant when the British detonated 19 mines under German lines. This is the site of the most intense and protracted engagement of the Great War. For nearly 11 months, German and French troops waged an unrelenting battle. Despite the horrific losses on both sides, the iconic Battle of Verdun failed to be decisive for any of the combatants, though it effectively marked the end of Erich von Falkenhayn's military leadership. Today, the farmers' fields still bears its tortured marks. This was the site of three major battles during the war, the First (1914), Second (1917), and Third (1918) Battles of the Aisne. The second battle was the scene of the Nivelle Offensive — an engagement that cost the French 40,000 casualties on the first day alone. After 12 days of battle, French losses amounted to 271,000, compared to 163,000 German casualties. 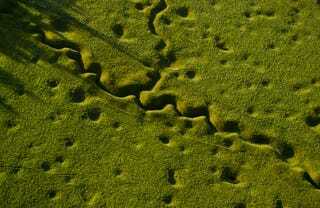 It was considered a disaster by the French public — one that cost General Robert Nivelle his job. The crater remains to this day, running nearly 70-feet deep. This used to be a small village. Located atop a strategic ridge, both sides resorted to digging and setting off explosive mines underneath the hill. In all, some 531 mines were detonated, including a 60-ton mine that vaporized the church and 108 men along with it. By the end of the engagement, the village ceased to exist in any recognizable form. It's estimated that 8,000 French and German soldiers went missing on the hill, their bodies never found. From June 1915 to November 1917, Italian forces fought the armies of Austria-Hungary in a series of 12 battles along the Isonzo River. Also known as the Isonzo Front, the engagements were disappointing for both sides and without any tangible tactical merit. But the casualties were enormous; about 300,000 for Italy and 200,000 for Austria-Hungary. This is the scene of the first major battle fought by American soldiers in the Great War. The Battle of Belleau Wood (June 1st-26th, 1918) was, in the words of General Pershing, "for the U.S. the biggest battle since Appomattox and the most considerable engagement American troops had ever had with a foreign enemy." Some 1,811 American soldiers were killed, but the marines were largely successful in expelling German forces from the forests. In 1915, Allied troops staged an amphibious landing in an effort to secure the Gallipoli peninsula and open a new front in Turkey. But after eight months of fighting, the land campaign had to be called off — an ill-planned and poorly thought-out engagement that forced Prime Minister Asquith to end his Liberal government and form a coalition with the Conservative party. It also cost Winston Churchill his job as First Lord of the Admiralty. In the picture above, the remains of an ancient castle, Sedd el Bahr Kale, can be seen from V Beach. Early in the war, in order to support France in the west, Russia launched an attack on Germany. Though outnumbered 2-to-1, the Germans responded by flushing out the Russian armies in the First Battle of the Masurian Lakes. It was a crushing defeat for Russia — one that contributed significantly to the prolongation of the war and the stalemate in the West.